Last week we had friends M & M over for dinner. It was nice to have some company and we came up with a very easy and straight forward menu that would be easy for me to make. I love having a holiday to coordinate the table with. Valentine's Day is one of my favorites, I just love the bright red with the pop of white. I bought flowers for the centerpiece, but forgot to take a picture of them. I bought the small hurricane with red floral ring and candles at Crate and Barrel after Christmas. When I bought them I could already imagine them on a Valentine's table. The four salad plates I bought after Christmas at HomeGoods, I love the sayings on them. Dessert was a store bought chocolate raspberry cheesecake and brownies. We also had some very nice bottles of wine to compliment dinner. My favorite out of all of them was a wine from a young wine maker called The Prisoner. Great reviews. I found it to be a very complex wine. I bought 6 bottles a while back, we drank the last one, and now I need to find more, I just love this wine. Red velvet and satin placemats, Target after Christmas, I bought these at 90% off, so I think I paid .99 for four. Yes, I bought two sets and one in off-white as well. Candle holders, all are from Crate and Barrel, the small red ones with the red candle sticks with white hearts are from a C&B summer sale as well. Cake plate with red and white grosgrain polka dot ribbon, HomeGoods. Not sure where to go for the next tablescape, I am sure I will be getting inspiration over at Between Naps on The Porch. I love all of the tablescapes that people post. Check it out for more inspiration. 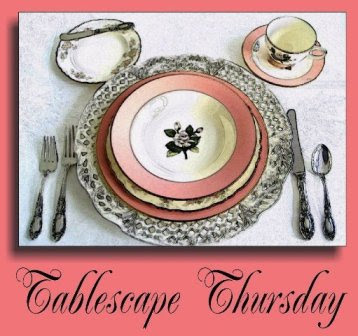 Love your Valentine table, especially those cute salad/dessert plates. What abeautiful setting for your gathering. Very pretty table. I just love those napkins! I wish we had a Home Goods. I saw those plates at HG...many they are cute. If I had a HG near me, I would be broke. The closest one is 3 hours away!! Beautiful table and the menu sounded scrumptious. You won me over with the polka dots and the fabulous menu!